Despite a long cinematic history, Tarzan remains one of the more maligned literary characters in making the leap to film. Despite points for effort and ingenuity, "The Legend of Tarzan" doesn't do much to improve on that tradition. 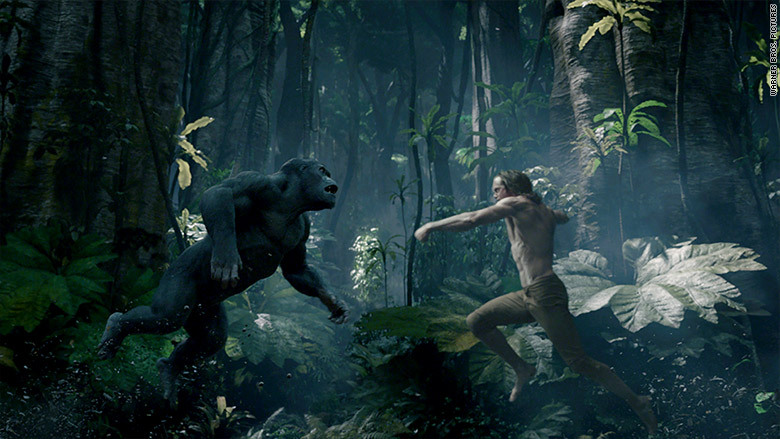 Directed by David Yates (a veteran of the Harry Potter movies), "Tarzan" knows its way around computer-generated animals, a far cry from Johnny Weissmuller wrestling with rubber alligators or dropping in nature footage in the 1930s and '40s. As a consequence, "Legend of Tarzan" feels like the sequel to a movie that wasn't made -- at least with these principals -- dealing with the character's origins in brief, gauzy flashbacks. Instead, it opens in England circa 1890, where an American named George Washington Williams (Samuel L. Jackson), based on a real person, approaches John Clayton (Alexander Skarsgard) about journeying with him to the Congo. The goal: To expose the exploitation and enslavement of the people by Belgium's King Leopold. Clayton's invitation has come from the Belgian government. But it's really a trap conceived by Leopold's envoy, Leon Rom (Christoph Waltz, as his by-now trademark-able villain), to lure Tarzan to Africa. The plan is to trade him to a vengeful chief (Djimon Hounsou), gaining access to fabulous diamonds from the lost city of Opar. Screenwriters Adam Cozad and Craig Brewer have drawn from later editions of Tarzan creator Edgar Rice Burroughs' books. They have also sought to make Clayton's wife, Jane (Margot Robbie), more than just a damsel in distress, even if her abduction forces Tarzan on a perilous quest to retrieve her. In some respects "Legend of Tarzan" is a step up from previous adaptations. It's more fun than "Greystoke: The Legend of Tarzan, Lord of the Apes," which started well but became overly preoccupied with the duality of the title character's wild and noble sides. Still, the movie winds up a bit muddled, in part because it has to work so hard seeking to remedy more troubling aspects of the Tarzan mythology. That includes the books' early-20th-century racial overtones, with the whole plot here animated by a strong anti-colonial message. Jackson thus provides Tarzan not only a squabbling companion but a balance to the whole white savior routine. Already a heartthrob from "True Blood," Skarsgard doesn't shed his shirt right away, but when he finally does, it's a marvel of human engineering. For the most part the movie looks great too, barring a few moments where the CGI rather literally runs wild. But this is a tough narrative to essentially join in progress, and a thankless title role -- part English lord, part taciturn, superhuman savage, part Dr. Dolittle, sharing tender moments with old pals the elephant and the lion. "My husband is no normal man," Jane ominously warns Rom. True enough, but "The Legend of Tarzan" is, finally, a pretty ordinary would-be summer blockbuster. "The Legend of Tarzan" opens July 1 in the U.S. and Canada.